FABTECH 2018 provides attendees with the opportunity to equip themselves with the knowledge necessary for helping their companies to be proactive in several key manufacturing areas. 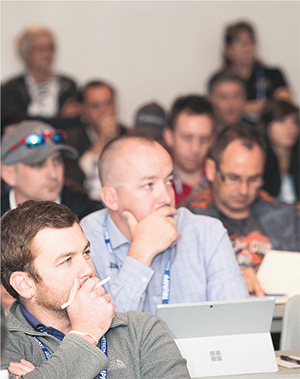 That opportunity, presented in the form of this year’s metalforming educational program, features 22 sessions. Topics include the ins and outs of working with advanced high-strength steels, application of evaluation tools for achieving quality stampings, using connectivity to collect and move data, technical sensing solutions for monitoring processes in progressive and transfer stamping, ensuring machine safety, and how to develop apprenticeship programs for press-room technicians. Sponsored by the Precision Metalforming Association, Fabricators & Manufacturers Association, Society of Manufacturing Engineers and Chemical Coaters International, here are metalforming-session details. This presentation provides useful information on guards, devices, distance, location and opening requirements, along with the electrical standard for industrial machines with respect to ANSI B11.19. Photos of safeguarding methods will accompany each topic. Learn about Lubri-nomics, the economic activity that governs the production, distribution and consumption of stamping lubricants, and how to evaluate lubricant chemistries and best practices for mixing, distribution and application. Designed to provide attendees with a complete overview of chlorinated-metalworking-fluid regulations, this presentation covers what the proposed chlorinated-paraffin regulation would affect, and why the regulation change ended and is now under full review. Also covered: the regulation’s impact on employee health and environmental safety, and chlorinated materials still available and the options for replacing them. This presentation reviews the updated Z244.1 language for control of hazardous energy to include the current technology of modern-day safety systems. Learn how to utilize this technology for enhanced operator and machine efficiency in the current production environment. This overview of sensors commonly used in progressive dies for preventing die crashes provides real-world sensor applications and covers sensor selection, installation, wiring and programming logic for sensors used to monitor such events as part ejection, material feed, shut height, stripper position, cam/cylinder return, material buckle and other feed problems. This presentation shows exactly how to test all types of electronic sensors on a test bench to ensure successful application on the actual shop floor. Implementation of part measurement, die adjustment and part tracking can result in 100-percent verification of critical part features, increased machine utilization, accurate production and scrap rates, and more reliable die protection. Learn practical methods for selecting, applying and integrating sensors and control systems in order to fulfill accuracy and quality requirements. Advanced high-strength steels (AHSS) offer high strength combined with enhanced formability. This presentation discusses the properties and performance of various AHSS grades and their effects on the stamping process. AHSS (1000+ MPa) can present formability challenges as they have a greater tendency to retain coil set and tighter tolerances between yield and tensile strength. This presentation highlights key considerations, such as components, materials, power sources and design, when specifying a straightener to process AHSS, as well as questions customers should ask of their equipment suppliers. Learn about options to improve tool life when running AHSS materials. The discussion will cover tool steels and coatings, how to select the best combinations for your application, and alternative manufacturing methods for tooling, focusing on reducing tonnage and stripping forces for die optimization. Real-time and nondestructive monitoring tools have been used widely for various manufacturing processes such as joining and fabrication. This presentation discusses present and possible future applications of real-time and nondestructive evaluation tools to monitor and assess incoming-coil properties, blank-surface finish/lubrication, die stress, part temperature, final-stamping quality such as springback, and geometry tolerances for metal-stamping processes. Using real-world case studies, this presentation shows how the open standard, IO-Link (IEC 61131-9), helps eliminate downtime in the press shop due to shut height, roll alignment and quick die changes, while improving press maintenance. Will Healy III, Balluff, Inc. Solving metal-stamping problems in a progressive die can be challenging. Correct solutions are not always obvious. Even when they are, they seldom address root causes. This presentation provides a methodical approach to solving complex problems associated with progressive dies. Procedures performed with the die in the press are presented to assist in isolating and identifying the root cause of common problems. This presentation details a low-cost approach to die protection, a topic of interest for shops that avoid formal and more costly sensor programs. This session shows how to collect accurate, timely and unbiased data automatically from the shop floor and then convert that data into information that flows to ERP and MES systems. Learn to use tools that communicate in real time the status of every machine and process; track KPIs to enable real, measurable process improvements; and notify specific troubleshooters to the existence of production issues. Why Preventive Maintenance in the Pressroom? This presentation discusses proper metal-stamping-press maintenance and its relationship to increasing throughput on the factory floor. Critical functions, areas to be monitored and procedures will be discussed. Understanding material properties, and how those properties respond to stress, is key for solving metalforming problems. This presentation offers a basic understanding of material properties and basic forming modes so that the user can identify and solve metal-formability problems more efficiently and effectively. Process simulation enables engineers to predict metalforming behavior on computers, rather than through shop trials. Software that integrates design-of-experiments (DOE) methods with finite-element analysis allows automated studies of process changes and design iterations with statistical feedback. The presentation focuses on the use of DOE to calibrate, optimize and gauge the robustness of bulk metalforming applications, such as stamping and drawing. James Miller and John Walters, Scientific Forming Technologies Corp. This presentation addresses the fundamentals of effective, off-the-shelf sensing solutions/technologies for monitoring processes in progressive and transfer stamping. Also provided: a review of best practices for error-proofing tooling; electronic measurement solutions found in stamping processes and methods for discrete electronic detection; application pictures with specific monitoring scenarios; and a section on RFID systems used for shut-height monitoring and dunnage/cart monitoring. A review of through-the-window and front-and-back-mounted transfer selection criteria, coil/blank-width impact, feed considerations, die access, press maintenance, and die and part design are covered during this presentation. Over the past dozen years, newer grades of AHSS and aluminum alloys have demanded different practices and deeper diligence in dealing with springback than were previously developed for mild steel. The role of virtual engineering in managing springback for these AHSS and alloy materials is crucial. This presentation outlines best practices in leveraging these tools toward acceptable dimensional outcomes, without compromising cost and timing. Kidambi Kannan, AutoForm Engineering USA Inc.
Metal stampers wishing to be more competitive are focusing on the creation of formal apprenticeship programs for their pressrooms. Today's skills crisis has refocused these companies to better train their stamping production personnel. This presentation details successful examples from companies that have achieved exceptional levels of skill sets in U.S. and Canadian pressrooms.